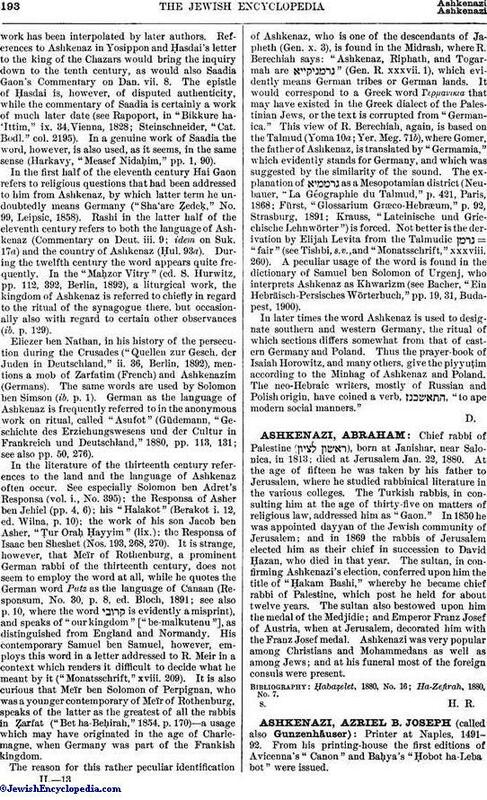 Chief rabbi of Palestine ( ), born at Janishar, near Salonica, in 1813; died at Jerusalem Jan. 22, 1880. At the age of fifteen he was taken by his father to Jerusalem, where he studied rabbinical literature in the various colleges. The Turkish rabbis, in consulting him at the age of thirty-five on matters of religious law, addressed him as "Gaon." In 1850 he was appointed dayyan of the Jewish community of Jerusalem; and in 1869 the rabbis of Jerusalem elected him as their chief in succession to David Ḥazan, who died in that year. The sultan, in confirming Ashkenazi's election, conferred upon him the title of "Ḥakam Bashi," whereby he became chief rabbi of Palestine, which post he held for about twelve years. The sultan also bestowed upon him the medal of the Medjidie; and Emperor Franz Josef of Austria, when at Jerusalem, decorated him with the Franz Josef medal. Ashkenazi was very popular among Christians and Mohammedans as well as among Jews; and at his funeral most of the foreign consuls were present.